NOTE: This connector was designed for RG14 cable. RG14 cable was used many years ago and is not currently produced. The RG217 is similar replacement cable. Specs are different so consult the data sheet. You can make it work for RG217 with some minor effort. 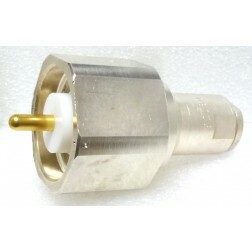 The RG217 has smaller outer diameter on both the dielectric and center pin. Use extra solder when installing center pin and heatshrink is must to keep cable centered on body of connector. NOTE: This connector was designed for RG14 cable. RG14 cable was used many years ago and is not currently produced. The RG217 is similar replacement cable. Specs are different so consult the data sheet. See Description for more information.